A key figure in the breaking of the Watergate scandal that ended the Nixon presidency will return to his alma mater, Syracuse University, for an open conversation about his experiences, followed by a book signing. Harry Rosenfeld ‘52, former editor at The Washington Post and the New York Herald Tribune, will discuss his new book, “From Kristallnacht to Watergate: Memoirs of a Newspaperman” (SUNY Press, 2014), on Tuesday, Sept. 16, at 4 p.m. in the I3 Center (Room 432/434) of Newhouse 3. The event is free and open to the public. For more information, contact Samuel Gorovitz, professor of philosophy in the College of Arts and Sciences, at 315-443-9331; or Roy Gutterman, associate professor of newspaper and online journalism in the S.I. Newhouse School of Public Communications, at 315-443-3523. Rosenfeld’s visit is co-sponsored by the Ethics Program in the college’s philosophy department; and Newhouse’s Tully Center for Free Speech, which Gutterman directs. Although Benjamin Bradlee, the Post’s executive editor, received much of the credit for the Watergate coverage, it was Rosenfeld who worked closely with reporters Carl Bernstein and Bob Woodward in developing the story, eventually earning the paper a Pulitzer Prize Gold Medal for Public Service. In his new book, Rosenfeld riffs on his complicated relationship with Bradlee, as well as the unlikely pairing of Bernstein and Woodward, who, in the early ‘70s, were relatively young and unknown. Born into a family of Polish furriers and tailors, Rosenfeld traces his ambition to become a journalist to his childhood in Hitler’s Berlin. He saw his father taken away by the Gestapo in the middle of the night and witnessed the burning of his synagogue on “Kristallnacht” (the “Night of Broken Glass”), a government-organized pogrom in the fall of 1938. When his family fled to the United States, Rosenfeld felt a responsibility to ensure that what had happened in his homeland would not be repeated elsewhere. “Looking back, I discerned a theme underpinning much of my journalistic labors: holding to account the accountable, the more powerful the better,” says Rosenfeld, the inaugural recipient of the college’s Distinguished Alumni Award. 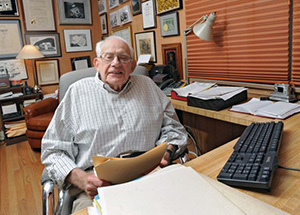 Rosenfeld’s quest for accountability resulted in a long and illustrious career as editor—first, at the fabled New York Herald Tribune and then at the Post. He also went on to oversee two newspapers in Albany, N.Y., and the Los Angeles Herald Examiner. Today, the retired newspaperman remains active as an editor-at-large and a member of the Times Union editorial board in Albany.